Verdi’s crackling version of Shakespeare’s monumental play attracts singers and conductors who are willing to take risks in pursuit of drama. With James Levine’s taut conducting, the dimensions and colors of Verdi’s score are revealed, galvanizing Sherrill Milnes (Macbeth) and Renata Scotto (Lady Macbeth). 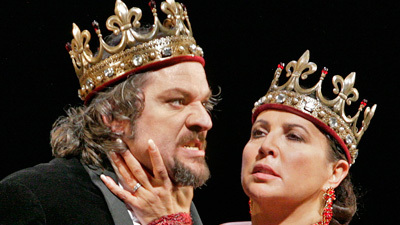 Milnes’s strong baritone gives imposing dimensions to Macbeth, and the way Scotto combines the words with the music demonstrates why some people say Lady Macbeth is really the leading character.